Durable – The CoolSafe box is made of triple density expanded polystyrene and molded under extreme pressure creating a durable container that guarantees temperature stability. Easy to Use – Easily interchange Cool Chambers and Cool Bricks for different sized tubes. No Mess – Messy ice buckets are now a thing of the past! Super temperature-conducting solid metal surrounds the vast majority of the surface area of the microtube, keeping the entire sample or tray of samples cool. Each Cooling Chamber is a solid aluminum block that surrounds inserted tubes to guarantee sustained hot or cold temperatures. Each Cool Brick allows up to 10 hours of benchtop temperature stability. Two temperature zones are available: 1°C and -10°C. The CoolSafe Box is made of triple density expanded polystyrene and is molded under extreme pressure to create a durable container that guarantees temperature stability. 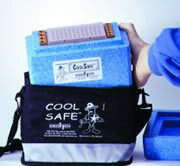 The CoolBag is an insulated cooler for added coolness of critical samples. Use the shoulder strap for easy transporting from lab to lab. Multiple Uses– Ideal for use on hot or cold plates or for temperature sensitive liquid transfers. Durable – Anodized aluminum blocks will not rust or corrode. 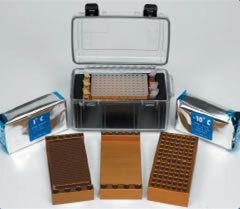 Ideally Sized– A variety of options are available to accommodatePCR tubes and trays, 1.5 ml tubes, 15 ml and 50 ml conical tubes. A variety of Specialty Chambers are available to keep samples cool and on ice while you work. Freeze these Chambers overnight for added cooling convenience. These Chambers do not fit the CoolSafe system; use separately (*61955-30 not pictured). Each Chamber is an anodized aluminum block. Excellent temperature conductors. Use with hot plates or with our Ice Pans & Ice Buckets. 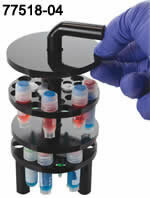 The Double Chamber fits two 96-well PCR trays or individual tubes and strips. Each edge can accommodate up to (12) 0.5 ml and (8) 1.5 ml tubes. 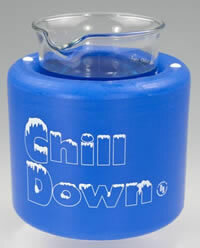 Great for temperature sensitive liquid transfers. It measures 6 3/16" x 6½" x 1". Description: Anodized aluminum block sized to fit 64 1.5 ml microtubes (16 holes per 'step') for easy viewing of samples when in the freezer, on the bench-top or in an ice pan or ice bucket. 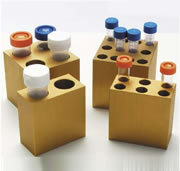 The 80-well Chamber is a solid, anodized aluminum block sized to fit 1.5 ml microtubes. An excellent temperature conductor for use with hot plates and ice buckets. It measures 8.25" x 2.625" x 1.25". The CoolCube™ is made to safely store samples on the lab bench, without degradation from temperature fluctuation. Made of a high strength polymer and a gel refrigerant, it will maintain a temperature of approximately 0°C for up to 4 hours. Store the CoolCube overnight in the freezer and it will be ready to use. 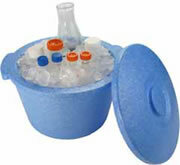 It will keep samples cool, but not frozen, without messy ice buckets or wet tubes. With two sides, it can also be used as a PCR workstation. 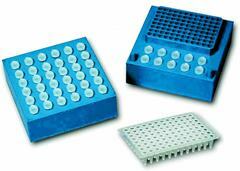 One side has wells for 10 standard 1.5/2.0 ml microtubes and one 96-well PCR plate or 0.2 ml tubes/strips. The other side can be used to hold 36 standard 1.5/2.0 ml microtubes. Each well in the Chamber contains locking ridges that do not allow the cryovial to turn. This unique feature allows for one handed cap removal. Ideally Sized – For use when only a small number of microtubes are required. Maximize Work Area – Each Mini-Chamber will fit in our 1L Glacierbrand™ Ice Pan (6.13" x 6.13" x 3.61"). Minimize Ice – Less Ice is needed to cool these chambers. Less ice means less mess. Same Great Engineering – Mini-Chambers are anodized aluminum and utilize our "Surround-A-Tube" cooling technology. Half the price of competitor's ice pans! Chemically Resistant – Resistant* to mild chemicals as well as ice-alcohol slurry, dry ice and liquid nitrogen. 63311-xS Small Ice Pan 6.13" x 6.13" x 3.61"
63311-xM Medium Ice Pan 12.25" x 8.75" x 4.75"
63311-xL Large Ice Pan 17.25" x 13.50" x 4.96"
Excellent Insulation – Made of the same triple density expanded polystyrene as our popular Ice Pans. Preserve ice 30% longer! Won't Sweat – Thick insulating walls will not sweat. Easy Grip – Robust handles make buckets easy to carry. Includes Lid – Use the supplied lid to maximize cooling. Heavy Duty – Solidly constructed to be unbreakable under normal laboratory conditions. Chemically Resistant – Resistant to mild chemicals* as well as ice-alcohol slurry, dry ice and liquid nitrogen. 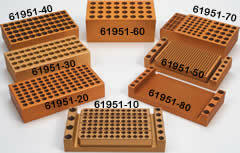 Flat bottom microplate model has magnets covering entire footprint to accept all standard micro-plates with any number of wells; 6, 12, 24, 48, 96, etc. Corning® Cryogenic Workstation features a reusable cryogenic vial rack with a removable storage rack. Rack holds to 30 vials. The tray can be used to hold water or crushed ice. The racks and trays are made of autoclavable polycarbonate. Ideal for keeping PCR® reagents, enzymes and other biochemical reagents cool while working at the bench. Filled with insulating gel, the Mini Coolers can also be used for controlled freezing of samples for longer temperature retention. 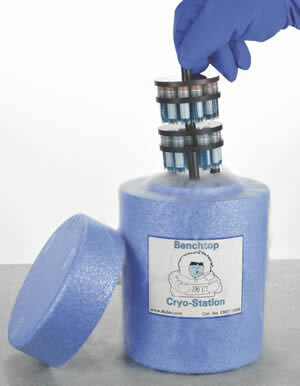 These rigid single mold polyurethane provides durability for chilling your temperature sensitive samples. Excellent insulation properties for ultra cold--use with ice, LN2, ice-salt slurries, and more. They come with a convenient lid which nests beneath bucket or pan They are available in either a bucket or pan and come in a multiple size assortment. 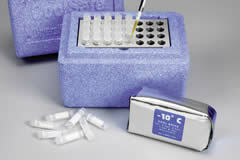 Rigid single mold polyurethane provides durability for chilling your temperature sensitive samples. Excellent insulation properties for ultra cold--use with ice, LN2, ice-salt slurries, and more. Minimize evaporation loss with snug fit lid. Easily remove with comfortable recessed knobs. Keyed lid and base fit together to conveniently store lid under base. Use handy pour spout with melted ice, water, and solutions. 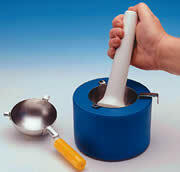 Ergonomic handles safely transport bucket or pan from work area to sink. Deep internal cavity has enough room to add one of your racks. Tapered sides make stacking and storage compact.